I know a recent thread discussed the Pro's & Con's of locale BNI involvement. Does anyone know about the Organization ? Political, Legislative, Religious, Environmental or other axes to grind? Last edited by Billy Stephens; 12-07-2007 at 02:36 PM. BNI is a for profit business. It's religion is money. Not knocking them, that is just the primary motivation, one guy came up with a concept that works to create referrals for the participating members. You help each other succeed. Not much else there as far as I know. I have been part of two BNI groups many years ago. They were worthless to me. A few months ago, in a weak moment, I was talked into going to a BNI get together. I met a guy that was also there as a invitee...he gave me a referral that afternoon, and by coincidence, I was able to give one to an appraiser at the meeting. Anyway, I decided to join a chapter and give it another try. I have only been a member for about three months. I have already received 8 jobs from this group. What I found interesting, none of them came from the Realtor in the group. She has since left the group and we are searching for a replacement. The banker in the group asked me what she could do to help promote my business. I am very pleased with my membership in this group, however, I know that it doesn't always work out so well. I think you have to try the group on and see how it feels. There is a cost involved, to join and also a monthly dues. I made mine up very quickly. I have also had good luck with Tradebank. There is also a cost involved with that group. The biggest benefit I get from Tradebank is the ability to eat out a lot at a greatly reduced rate (kind of involved trying to explain it). My mechanic joined recently, so my maintenance and repair bills have been greatly reduced. I would be happy to discuss either organization privately. I also had enough referrals to pay my membership right away. 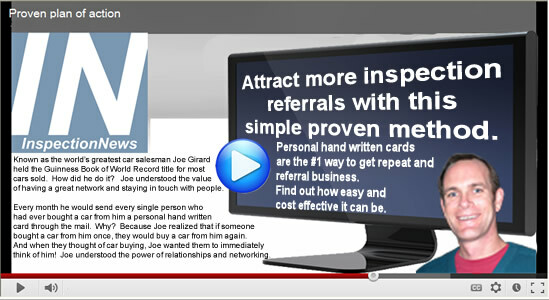 Kind of slowed since then but the whole idea is to turn those referrals into more referrals from the new clients. It sometimes takes a while but if you join an early morning group, it doesn't disrupt the rest of your day. I have visited several BNI groups and was about to join one, but when I was getting berated for not spending enough time doing "BNI" stuff and being accused of shirking my responsibility it got to be just too much. I had personal items that came up, out of town business for "my" business as well as as some inspections that had to be done during the BNI meeting times and I was told to make other arrangements for those efforts. I was able to graciously bow out. I know that the group does work for many folks and that is very good. It is just not a "one size fits all" group. I know of several other groups of "former" BNI folks who have taken many of the BNI positives and are doing quite well also. I echo what Jack and Nolan posted. The BNI model works better for some than others. The person that is head of the group owns the franchise, so he/she is the driving force and the person that is in charge of keeping folks active in the chapter. If you are lucky to get into a good chapter, it might work well for you. As for BNI or LeTips, they never worked for me. I have belonged to a small-business referral group since going into business here in Florida in 2003 and it has been very rewarding, it is not a BNI group but it has many of the same similarities, just like anything else in life you mostly get out what you are willing to put in. I have been to quite a few BNI meetings around the counties in which I work, in most cases the successful groups have a home inspector who is also a member of ASHI, it appears that ASHI & BNI are complementary with one another, at least here in the Greater Tampa Bay area. I visited the local BNI chapter and wasn't impressed. The concept is sound, but if the members in the chapter are not active, then the money is better spent elswhere. I ended up joining another leads group that cost less. I just dropped out of it. I was in it over 8 months, and got one lead. I have since joined another leads group that is three times the size, but hopefully will pan out. BNI is fine, there are other leads groups that do the same thing. Some cost more, some less. BNI is pretty high in my opinion, but the local chapter wouldn't gain me any profit. If you find a good leads group, you can really make some money. If not, you will be frustrated.